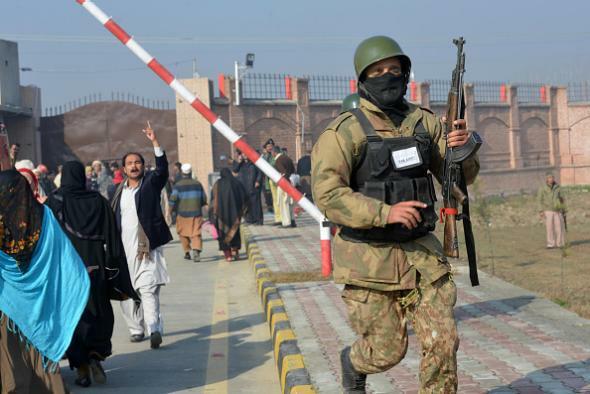 Taliban faction claims attack on Pakistan university. Pakistani soldiers at Bacha Khan University in Charsadda on Jan. 20, 2016. Under a heavy fog on Wednesday, gunmen scaled the rear walls of the university around 9 a.m., firing into the air, witnesses said. Security forces killed the attackers before they could detonate suicide vests, said Saeed Wazir, the Charsadda police chief. The dead included students, a senior faculty member and four guards, said Fakhr-i-Alam, a senior government official. The settings for the attacks were the softest of soft targets: a shopping mall in Iraq; a hotel and a cafe in Ouagadougou, the capital of Burkina Faso; a popular shopping area in Jakarta, Indonesia; and Sultanahmet Square, the historic and cultural heart of Istanbul. Seemingly uncoordinated, the indiscriminate violence highlighted the goal of Islamist militants determined to sow terror in disparate corners of the world. Wednesday’s attack is believed to have been perpetrated by four individuals, who were all killed by responding authorities.